The first thing I noticed about 'Circuit Breaker,' Image Comics' new series from Kevin McCarthy and Kyle Baker, was the fantastic cover with the pink-haired girl with big bright green eyes soaring through the sky. The girl is Chiren, a charming young lady who just happens to also be humanity's last defense against giant deadly robots. In world ravaged by war, the robots created to fight for humans have revolted causing Japan to be the last inhabited place on earth. The creator of those robots built a fail-safe to stand against those sentient mechanical nightmares in the form of a teenage girl. It's a riff on a familiar theme, especially lately, of man's self-destruction through technology. McCarthy and Baker create a chaotic world that tries to straddle different formats while balancing darker themes. The somber realization that people died and that robots continue to threaten people as terrorists is a heavy subject but Baker's cartoony manga-inspired art contradicts that tone. What looks like an all-ages book takes a serious turn when a robot begins to leak serin gas in a train filled with commuters. This is not fluffy stuff. Officer Seiko Udoku and Assistant Police Inspector Karo Tosen provide a lot of background with some exposition. The book is self-aware and admits to the "information dump." Unfortunately, it seems rushed as the dichotomy of the narrative come into contention between humor and despair, danger and levity. It's kind of all over the place looking for a center. Baker's art is playful and broad with big expressions and big faces. It tells a different story than what is written. The body language is comedic but the dialogue is serious. These are robots willing to wipe out the rest of humanity if given the chance after all. Baker does a great job despite losing continuity during a scene where there's an abrupt jump from one panel to the next. 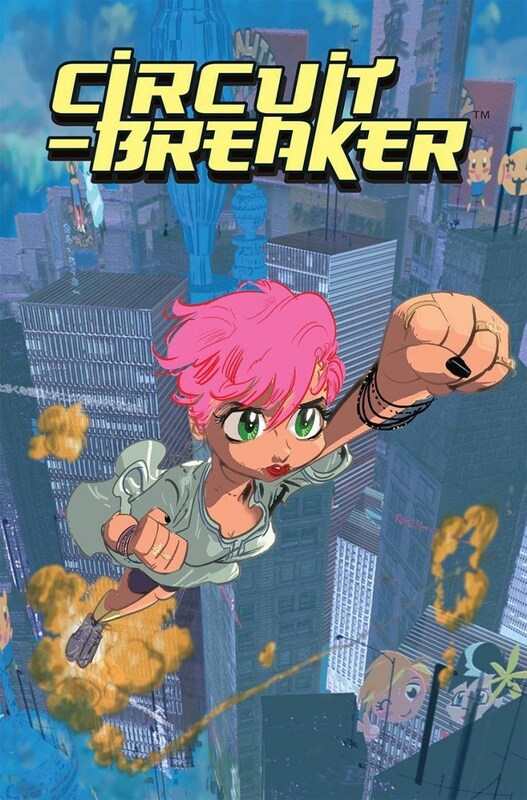 'Circuit Breaker' has potential to be a great story about an endearing android girl fighting big bad robots with an underlying message of the politics of fear and societal discrimination. The first issue wants to say all this and more but there's so much going on that it turns to white noise in the narrative and in the art. It's worth checking out for issue two to see if it turns to a cohesive coherent read.